This is the tricky moment where the Duchess of Sussex was ushered into a car by the Queen, after she first offered to let the monarch go first. Meghan Markle joined her grandmother-in-law in Cheshire for their first joint royal visit together today (June 14), and they were later escorted towards a waiting car. Footage from LBC shows a moment of confusion between the pair, as Meghan first offered to let the Queen get in the car first, before asking Her Majesty: "What's your preference?". Meghan is thought to have offered to let the 92-year-old go before her, as she prefers to sit behind the driver's seat. The Daily Mail has reported that it is "a case of habit not protocol" that the Queen always sits behind the driver, as she has always preferred being directly behind whoever is driving. "Meghan was probably not aware of this and the royal household may have forgotten to brief The Duchess of Sussex in this nuance," said etiquette expert William Hanson. 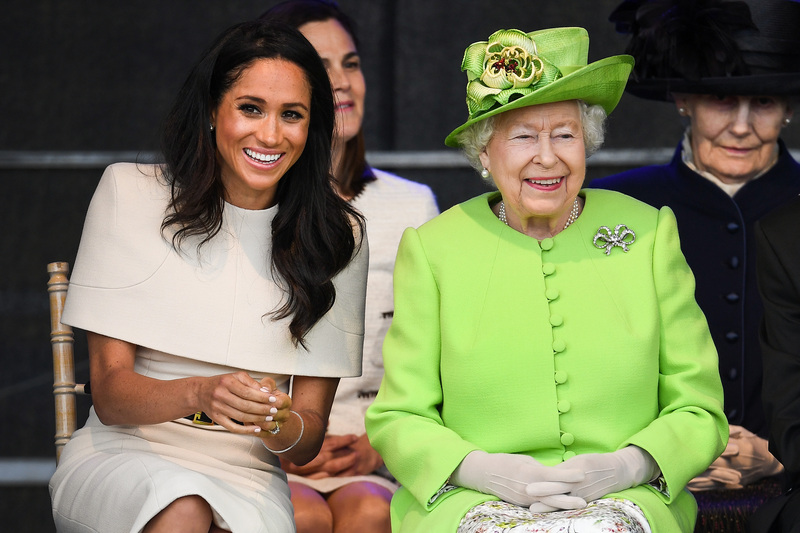 "It was, however, a considerate gesture from the Duchess of Sussex to consider where the Queen would like to sit." The Queen was joined by Meghan to officially open the Mersey Gateway Bridge and Chester's Storyhouse Theatre. They will then head to a lunch at Chester Town Hall, as guests of the city council. This is the first time Meghan has attended an event with the Queen, without husband Prince Harry.